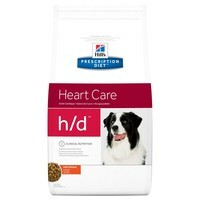 Hills Prescription Diet HD Heart Care Dry Food for Adult Dogs is a complete and balanced diet formulated to help manage the symptoms of heart disease and related fluid retention. Containing nutrients such as L-Carnitine and Taurine that specifically target the heart to help promote its function and good health, Hills H/D also contains reduced sodium levels to help reduce fluid retention caused by problems with the heart valves and/or muscle. Best product on the market. My dogs has been on it for four years following the recommendation from his Vet and the Cardiology Specialist at the Veterinary School in London. The small pellets make it easy for small breed to eat. It looks like there are all the right supplements to support heart function that have been described in the scientific literature, so there is no need to buy other expensive supplements. Will recommend to any pet owner whose dog has been diagnosed with heart disease.